NOTE: You will see most everyone below has what we call a cowboy or cowgirl “alias.” We do request you come up with one prior to the ride, but it’s not mandatory. Why an alias? Who wants to ride with Bob, Jim, John, Bill or Steve when you can ride with Curly, Dutch, Doc, Ellsworth, Duke, and others. This is your cowboy/cowgirl fantasy… so make the most of it and have fun with it. I don’t know what more can be said about this ride that the previous comments haven’t already covered. This was my 4th ride with GAA, during and after each ride I think to myself can this get any better. But, it always gets better. It’s difficult to say I have a favorite ride, because each one has it’s highlights. However, this location is like no other, an experience of a lifetime. Thousands of people visit Monument Valley, but very few get to go to some of the places we rode. We rode deep into the valley where vehicle aren’t allowed and can only be reached by horseback. The pictures just can’t convey what the eyes see. It is an awe inspiring place and the vastness at times can be overwhelming. Steve and Marcie are the best hosts and they make sure everyone has a great adventure. Become part of the GAA family, you won’t regret it. Susu (my sister) and I just landed back home and are missing the GAA group and trail rides already! What a terrific time we had; thank you for all the effort you both put in to researching, organizing, planning and executing such an exciting and fun-packed four days, we loved it all!! Again, MANY thanks for an such a memorable adventure! An adventure of a lifetime!! Steve and Marcie are terrific hosts, lots of fun, lots of laughs and planned lots of beautiful, exciting and breath-taking rides through Monument Valley. The wranglers are top notch and their horse choices for each rider were spot on. Many thanks to Steve, Marcie and “Wrangler Crew” for making the time spent on the John Wayne GAA such a wonderful experience! Please add two spots for the waitlist for Deadwood for us. I will look on your website asap to get the dates for Vendetta ride and will get back to you. The Monument Valley ride is a “Western” dream. We rode through so many wonderful places that we’ve all seen many times in film. Steve, you and Marcie make all the riders feel special. This year, 2018, was my second Monument Valley ride and I can’t decide which one was best. Thank you for a wonderful experience. Joan and I had a great time even though my ostomy and her knees prevented us from riding every day. I knew when I signed up that I might not make all 4 days but was hoping for 2 or 3. At age 80, I might not get another chance. I was determined to try anyway. I can’t lift more that a gallon of milk so Joan bears the brunt of baggage handling when we travel. Having had 2 separate parastomal hernia repair operations because I took on more than I should have, I reluctantly decided Tuesday night that the risk of a 3rd was not worth riding again with all the bouncing on my ostomy. Nevertheless, as an avid Western fan, my dream has been to ride horseback off the beaten track somewhere in the remote West. To ride through Monument Valley on the Navajo Reservation with its John Wayne and Western movie history seemed perfect. Riding with a wild bunch of very nice people dressed in Western garb was just icing on the cake. We had a great time and enjoyed the ride and meeting and talking with so many nice people. I know a lot of work and coordination goes into organizing an event like this and I think you and Marcie did a wonderful job and were extremely adept in handling everything in a very friendly, humorous and efficient way. Congratulations. Wonderful job. I might even consider next year and try for the Thursday or Friday rides that I missed this year. A big, big thanks to you and Stetson for one amazing week. Looking forward to the next! Wow! I really can’t put in to words just how great the John Wayne Monument Valley Ride was. I’ve been in education for over 45 years and felt it was time that I took a real vacation. I wanted to incorporate my love for horses in this vacation. A quick google search brought me to Great American Adventures, and particularly the John Wayne Monument Valley Ride. This was exactly what I was hoping to find. My love for horses, my love for westerns, and an adventure that incorporated both. Wow! To say that the scenery that we rode in was spectacular would be an understatement. It was beyond that. I can’t even put it into words. It’s something that must be experienced to truly understand this adventure. The people that experienced this with me were such a great group of individuals and couples from all over the United States and Canada. I was really amazed at how open everyone was to developing friendships. Most were talking about signing up for another one of Steve and Marcie’s adventures. I know that I am anxious to go on another. I plan on completely retiring after this school year, but I plan to take part in more adventures with Steve and Marcie and Great American Adventures. Riding through Monument Valley had always been my dream but, coming from the UK, I was a bit apprehensive about signing up for it. Although I was an experienced rider, I took some lessons in Western riding before I went on my first ride but I needn’t have worried – the horses are so well trained and the organizers so experienced that they can look at you and immediately allocate the correct saddle – I could have been a novice rider and I would have been fine. And I need not have worried about fitting in. The whole group was welcoming and friendly and subsequent rides have been like coming to a family reunion. This was my eighth ride with GAA. The scenery is amazing, the rides are fantastic and I just want to keep coming back again and again. I left a review for you on the site, but I also wanted to thank you both personally (as much as an email is personal). This was the best experience I have had in a long time. Even though I was not quite prepared for the more rugged riding, that in no way diminished my overall experience. You both put a lot of work into making these rides unforgettable and it shows. I will find some place to bone up on riding rougher terrain and will be more than willing to try any ride in the future. I wish you the best of luck in dealing with the Navajo Nation in trying to continue these rides. “Duke” would approve! Thank you a thousand times over! I arrived home after my extended adventure and I would like to thank you both for making my trip so wonderful. I have enjoyed all three rides immensely this year (Jesse James’ Great Train Robbery, Wyatt Earp’s Vendetta Ride, and John Wayne’s Monument Valley Ride) and would do it all again tomorrow (although I wouldn’t get permission from home). Thank you for being such special friends and I look forward to seeing you next year. Kind regards and best wishes. Peter Mackay, “Pete Tenderfoot,” London, England … an after thought….. Thank you for the majestic, inspring ride in Monument Valley. It was soooo perfect! (because of all the planning you two do). The place was special and so were the people. Thank you!! After 2 rides with you guys, my personal thought is: this is the most fun you can have with your clothes on. But my thoughts are frequently not PC or postable. Marylee and I send you our sincerest thanks for a terrific ride — wonderful people as fellow riders, great hospitality and food from Gouldings, skilled and friendly wranglers, and knowledgeable and caring guides in Effie and Lauren. Monument Valley is truly a national treasure and, moreover, a Navajo treasure as well. We were particularly impressed with the wrangler care and Effie’s direction that we respect her land and that of her people. Her sharings of family and cultural history were interesting and memorable. Everyone on the ride was particularly careful not to disturb the heritage and ecology of the land, leaving it as pristine as possible. There is a sense of place in Monument Valley that is unique. Our perspective has changed since visiting. It has more dimensions and an ever-changing beauty that was unexpected. We have come away with a hope that future generations may have the opportunity to experience this wonderful place. For us who have now been immersed in the beauty of this sacred place up close and personally, the planned and thoughtful horse back rides organized by Great American Adventures — with no detail left unaddressed and to the benefit of the Navajo carekeepers who live in the Valley — allow its participants over a span of several days to become fully involved into the vistas, culture, arts, and rich history of the Navajo inhabitants while maintaining the highest standards of respect to the land, realizing we are but visitors who will leave as small a footprint as possible during our passages. Please feel free to pass on our testimony to the Navajo leaders and to thank them for their consideration in allowing Monument Valley and its people to responsibly share and balance its wonderment, heritage, and legacy for visitors for generations to come. Thanks for a wonderful experience and for doing this. I wanted to express our thanks for the great time we had on the recently completed, “John Wayne’s Monument Valley Ride.” Lisa and I experienced the ride of a lifetime! To experience the scenic wonder of monument valley on horseback is almost surreal. Adding to this experience was the ability to share the land with our Native amerian brothers and learn of their heritage and customs. It is our hope that in future more people would be able to enjoy and learn from the land and its residents. Viewing the valley on horseback gave us the feeling of a distant time and historic past, not only of John Ford/John Wayne movie making but the real west as it was. It is something that should be cherished by every American! Our guide Effie was excellent and helped provide a good insight into the past and the ways of the Navajo people. We appreciate her efforts and owe her, her family and the Navajo nation a large thank you. We want to thank Great American Adventures, Gouldings Lodge, Effie and her family for letting us experience this adventure! We can’t wait to “saddle up” again! Thank you so much for guiding us on our rides in Monument Valley. The scenery was spectacular, natural beauty surrounded us on every side. Our guide made the history come alive for us as we saw the petroglyphs and ancient Anasazi and Navajo sites. By spending a week in the valley we were able to come away with a deeper, richer understanding of the culture, history and traditions of the Navajo people. It was an unforgettable week. Whether we were riding quietly along with no sound but horses and wind, or listening to stories or Effie singing us a traditional song, or sharing a picnic lunch we were absorbing the beauty and wonder of Monument Valley. We had the opportunity to see Monument Valley from a unique perspective. We know that the Navajo Nation faces a balancing act as does the National Park system between preserving natural beauty and historic sites and introducing people to that beauty and history. We certainly hope that the guided tours will continue to be recognized as an environmentally friendly, low impact way to strike the balance between preservation and tourist use. A quick thanks and I found this on my messy office desk… “ever notice that “what the hell” is always the right decision?” ……………Unknown Hollywood script writer. It certainly was the right decision for me to accept the challenge of going into the unknown of a horse ride through Monument Valley, Utah. I seriously haven’t ridden a horse since my teen years and was pleasantly surprised that I knew how to hop on. As Gonzo always said “when the going gets weird the weird turn pro”. I think I’ll rate myself all the way up to a ONE for another ride. The breathtaking views we were able to seek (ha) and see were a lifetime’s view to be sure. I am grateful to have had the opportunity to participate in this amazing moment of life. Another real giant plus – the wonderful people I met and hope to keep in touch with. Thanks again for putting together such a great experience. John Wayne’s Monument Valley Ride was my second adventure with Steve & Marcie. Two years ago I joined their Wyatt Earp’s Vendetta Ride, which was my childhood dream – ride with the cowboys – come true. These are two totally different, but equally awesome rides, organized with great dedication by Steve & Marcie that sense exactly what folks like me are looking for. Great stories, historical characters, period clothing, shooting irons, John Ford, The Duke, landscapes beautiful beyond belief, great Navajo guides Effie and Loren that told us about their family and the Anasazi, and – of course – great wranglers like Troy, Riley, Danny and young Payton on his first ride with Steve & Marcie’s posse. Each of us was given a horse according to our experience, but this was by no means your average trail ride. We have done some truly exciting stuff, the stuff you see cowboys in movies do, but always safe. Trust your horse, like Troy says, and I did! But most of all it is the people that make the ride, with Steve & Marcie bonding them to a family in a couple of days. This was another western adventure I won’t forget and I want more! As you know, I was an outfitter for a number of years doing mountain trip horseback rides. Therefore I believe that qualifies me to grade pretty hard on your operation, so I will. I am referring to your Monument Valley “Searchers” trip of November 2015. Keeping my remarks simple, I can’t think of one area that was not excellent. All events were well organized for maximum pleasure. The food, camaraderie, location, accommodations, horses, gear all fit the occasion. Two things that should be mentioned – Troy and his wranglers provided excellent stock and were very helpful to all and concerned about our safety – you made a good choice; the Gouldings Lodge operation – I was very impressed with the facility and the employees. The fact that local people were the primary staff made my heart sing, and that includes your guide as well. Steve and Marcie, thank you for a bunch of good memories! Enclosed is my check for the Monument Valley Belt Buckle. Got to have one to remember the AWESOME ADVENTURE! Thanks for everything. Dear Steve and Marcie, John and I had the time of our lives with you in Monument Valley! Best trip ever! I know John and Sue feel the same way! I can say that the Monument Valley ride is life changing! I was so impressed with the quality of the horses, how well organized it was. I can hardly wait till our next ride! Now that its over, I can’t believe I actually did it!! To ride Monument Valley on a good horse for five days was a dream come true. Rain, wind, snow – and I know this was exceptional weather with that front coming in – made the ride more memorable. The riders were all as excited as I was to be there, actually doing it. I cannot think of anything that you and Marcie could have done to make it better. Thank you so much for a Great American Adventure. We just finished our John Wayne Monument Valley Ride. The word that immediately comes to mind describing this adventure is “FANTASTIC.” Steve and Marcie Shaw have obviously put in great effort to ensure participants have a rare opportunity to witness one of the most beautiful places in the American West – Monument Valley. Every aspect of this adventure is first rate – beginning with the historic Gouldings Lodge; to the experience of the wranglers who helped ensure horses and riders were prepared for the daily journeys; to our wonderful Navajo guide, Effie, who shared family memories and directed us to rare Anasazi drawings. We viewed many of the movie locations from John Ford’s and John Wayne’s famous westerns. This is no casual “around the neighborhood” ride. We went where vehicles can’t go and we’re not tripping over weekend tourists. The weather provided interesting challenges – everything from warm, sunny skies to windstorms, rain, hail and snow. But Steve and Marcie had told us well beforehand to be prepared – that’s Monument Valley in November! My wife and I decided to take the optional addition day ride, and it was well worth it. We rode to areas that require special permissions, and our guide, Effie, made this possible. We were to impressed with this ride that we’re going on next year’s Tombtone “Wyatt Earp’s Vendetta Ride” adventure with Steve and Marcie. WOW! That is what Sue and I keep saying to ourselves. What a wonderful trip it was!! You run a very well organized adventure, had wonderful wrangler (who had excellent horses) and made sure that the food and service was top notch. What else can we say, you are definitely THE BEST at what you do!! When we booked with you over a year ago we were hoping we had made the right decision. When we showed up at Gouldings Lodge, we still didn’t know what we had gotten ourselves into. Then we met you guys and the rest of the Searchers and we began to get really excited. The drive out to the horse corral the next day (even with the wind blowing) was the point where we both said, oh yeah!, this is going to be the real deal. Wind, rain, snow and sunshine can’t keep The Searchers from finding what they were looking for. An absolute Great Experience!! What fun times we had. Meeting and spending time with you and Marcie was one of the bet parts of the whole trip. Sue and I have said this many times, if we lived anywhere close to you guys we are sure that we would become very close friends. We are the same age and have a lot of the same interests, not to mention the similar sense of humor :). None the less, we still consider you to be very good friends and we are looking forward to booking another Adventure with you. We have been looking at your website trying to figure out what to book next. I know it will be a great time whatever trip we decide on, that’s for sure. Just completed John Wayne’s Monument Valley Ride. As a member of “The Searchers”, I had a better time than even I could have imagined before the trip. You see… these rides are about living out all those childhood wants of playing cowboy in the Old West. As a person gets older, all of the cowboy shows we all grew up with are now a distant memory of a simpler, more romanticized time. Great American Adventures, conceived by our hosts Steve and Marcie Shaw aka Ellsworth and Stetson, allow a person to live out all of those childhood fantasies complete with dressing the part and riding trails to parts of Monument Valley unseen by the normal tour bus trips. Monument Valley is itself a wondrous place. Much of the scenery and rock formations may look familiar perhaps because Monument Valley provided the backdrop for the filming of five John Wayne movies as well as countless other well known westerns. The ability to travel through the valley guided by Effie, our Navajo guide, complete with Effie’s stories (and her charming giggling) of growing up in Monument Valley is priceless. I have to give a shout out to Troy, our head wrangler, and his crew for matching us with horses that equaled our individual riding abilities, and for keeping our journey over some reasonably severe landscapes and during some pretty inclement weather conditions safe. Although as graduates of this adventure, we cannot claim to be “true cowboys,” we can say we endured some of the conditions cowboys had to endure when out riding the range. That in itself may be a badge of courage! As much fun as anything, was meeting the other people, both men and women, who also were on this adventure. I was on the trip with my long-standing friend of almost 40 years, who introduced me to Great American Adventures and the fact this opportunity existed. I’m glad he did. Folks dressed the part, either cowboy or specific John Wayne characters or other childhood cowboy heroes such as Hopalong Cassidy. Cavalry Day was a treat in that we had several Civil War reenactors who looked authentic and played their parts well. All of the folks were into the experience, and in just a few short days, I made several new friends. Ellsworth & Stetson were the perfect hosts with no detail of the adventure left unnoticed or unplanned. In short, based on my experience with John Wayne’s Monument Valley Ride, I would highly recommend any of the various theme rides Great American Adventures has to offer. Happy trails to my fellow Searchers! PS after posting my testimonial on the website, within a few days reflection, the adventure gets even better! Thanks again to you and Marcie for all you do. I want to Steve and Marcie know how thrilled I was to be part of the John Wayne’s Monument Valley Ride. This experience was far greater than even I had expected. Every aspect of this journey was so enjoyable, that I cannot stop thinking about it. This began for me two years ago when I saw the ad in Cowboys & Indians magazine. Retirement finally afforded me this opportunity to participate in this adventure. I would highly advise anyone interested in movie history to come and experience this ride. Having needed a few days to rest after this, I watched the movies Fort Apache and The Searchers again. No one will tell me that on the Friday ride that we did not go in the area where the Henry Fonda character from Fort Apache, Col. Owen Thursday, met his demise at the hands of the Apache Indians. Thank you for allowing me to live a child’s dream to be a cowboy, carry a gun and ride a horse. I wish you and Marcie the best happiness. This Monument Valley Ride was our third time with GAA (the first being Wyatt Earp’s Vendetta Ride and the second was “The Ride With No Name” in Sicily, Italy). Each has been both rewarding and unique. All aspects were exceptional, including the wranglers, professional photographer, food and service, Steve and Marcie, and a special shout-out to all participants (a large group) who were always punctual and entertaining. The scenery, coupled with the cinema history and period dress, put one in another place and time. And thank you Apple Jack (my mount for a second time) for a spirited ride. I hope to meet him again in the near future. The Monument Valley Ride was just fantastic. This was a dream come true for me. I had been trying to figure out a way to ride Monument Valley on horseback since I first saw it in 1983. I truly understand how John Ford must have felt when he first saw it. Thank you and Marcie for a wonderful time. I want to thank you both for a very memorable event. I thought I had seen about everything there was to see, as I have ridden over half a million miles on 2 wheels in the lower 48, but Monument Valley is the most beautiful and amazing place God ever made and the trip you planned was the perfect way to see it. I feel very fortunate to have ridden the John Wayne Monument Valley Ride with both of you. A big thanks to our wranglers for all their hard work and for putting up with me – ha! My horse “Bertha” has given me a new perspective on riding drag (are you sure Rowdy Yates started this way?). Thanks again for giving me the Ride of my life! I will assume most likely everyone has seen some of Monument Valley through scenes in various John Ford films. Films such as Stagecoach, The Three Godfathers, The Searchers, Fort Apache and My Darling Clementine. Even Forrest Gump included a shot with Monument Valley as a backdrop. But none of these films expose you to the wonders and beauty of Monument Valley up close. Great American Adventures (GAA) is one of the best ways, short of being in a film shot in this great American treasure. Even then the grandeur of Monument Valley should get top billing. Steve and Marcie Shaw bring together everything you will need for a very memorable four or five day true western vacation on horseback. GAA arranges all the food, and a crack team of wranglers match you with a proper mount based on your riding experience. I must admit as a horse owner and rider for over 9 years, our Navajo guide led us on some trails that looked like only a mountain goat could navigate. But the horses are sure-footed and never faltered. If you want to get up close and personal with mesas and buttes that rise 50 stories above the sandy floor, a horseback vacation with Great American Adventures is a wonder-filled vacation. My journey with Great American Adventures’ Monument Valley Ride gave me an intriguing insight into the settlers of the Old West, along with a delicious taste of the magic woven by an ancient Native American culture, and allowed me to hear the stars in the night sky! As a painfully shy person, it was a real challenge for me to walk into this ride alone, but it was all so very worthwhile. For the first time in my life, I don’t know how I was able to live up to my friends’ expectations that my life is always expanding with excitement… I might have peaked in Monument Valley! I know you had some hesitations about having such a large group but it was wonderful. Please know how grateful I am for all your efforts to give us such a rich experience… thank you, Steve and Marcie, for this wonderful ride into history. This was a wonderful ride! We stayed at the historic Goulding’s Ldge. Our Navajo guide took us all into the reds and blues of this strange land. We were amazed by the Anasazi’s petroglyphs so close I could touch them and pottery shards from thousands of years ago. There were dried up stream beds where I searched in vain for arrowheads as we passed by. On our last night, as dusk approached, I could see the gray in the rocks that only a painter such such as Maynard Dixon would notice. I felt my shoulders warmed by the setting sun. I reflected on what it must have been like to be a Navajo or a cavalry rider among those picturesque monuments a century ago. Thank you for another Great American Adventure, this time with the John Wayne Monument Valley Ride. The scenery was spectacular. Our Navajo guides provided local history. Our wranglers were outstanding in their ability to take care of us and the horses. My horse was particularly suited to my riding ability – I was very pleased. The food was great. Of course, the chance to visit with everyone makes the trip worthwhile. Many of us have become good friends now and we seem like family. This year, several new people were welcomed into the family. Every trip with you continues to be a fantastic experience. I waited so long for this adventure. And now I can’t believe it’s over. Had a great time! You will definitely see me on future rides. Thanks again. A day hasn’t gone by since our return that I haven’t thought of the absolutely incredible time I had on your ride. And have relived each day in my mind. You both were the most excellent host and hostess, with every detail being an outstanding feature!! I can’t wait for your Comanche Moon ride in Palo Duro Canyon, Texas… I’ll be there! You guys did a great job! Great ride and great people! See ya on the Comanche Moon ride next year. This was the first true vacation that my wife Maggie and I have taken since I returned from Iraq 4 years ago. True, we have taken trips to visit family and business and conference trips plus time away to work on our farm every other week year round but this was fun and RELAXATION! The planning and pre-trip information and coordination was excellent. It was nice to get to a place and not have to think or worry about what to do next… other than what time to get into the right vehicle in the AM. Maggie and I really enjoyed the opportunity to meet people that have similar interest and were fun to be with. This was truly the most fun that I have had in a long time where alcohol was not involved! I guess my primary goal was to revisit Monument Valley in such a way that you can’t expect to do except via the venue Steve & Marcie Shaw provide. Horseback is the best way to get close and up front to see, hear, and learn about the geology, geography, and history of the area. Add the romantic aspect of Hollywood and John Wayne as a persona and icon of the West, what else could one ask? Having Effie as our Navajo guide was priceless. Troy and his crew of wranglers were the most professional and accommodating. And Steve and Marcie were just a pleasure to get to know and to be with. It is a testament to this event that Maggie wants to get back in shape and to be able to ride as well on the next trip with Great American Adventures. By the way, Steve. You do have some clout with the Navajo. After we got back home, Maggie realized she had left a drawer full of clothes in our room. She called and talked to the desk and house cleaning and “There were no clothes found in the room.” The next day she called back and talked to the manager and made it known that we were part of “Steve Shaw’s Great American Adventure.” The manager called back later and said Maggie’s clothes had been found and would be sent to her. Thank you Steve! We heartily endorse and recommend your trip and look forward to another Great American Adventure on horseback next year. You and Marcie are “top drawer!” Continue to air straight and fly high. Thanks Steve & Marcie for a great horseback riding adventure. I’ve wanted to ride into Monument Valley since I first saw this iconic part of the American West on the big screen in the movies John Ford filmed there on location. There are other rides that are offered in Monument Valley, but none of them offered what I wanted. I wanted a ride that offered a truer vision of what the American West was like before baseball caps, t-shirts, and sneakers. Your ride gave me that opportunity plus the added bonus of riding with other folks who enjoyed the West and its history both real and imagined that was created by the actors, directors and the films we grew up with. When I finally hang up my saddle and spurs, I’ll look back on this trip and realize how lucky I was to have this opportunity to experience this amazing land in true Western fashion. My wife and I went on our first “ride” when we attended the Monument Valley Ride, organized by Great American Adventures. Although we have had extensive experience with horses during our lives, we had never participated in an event of this type. We were delighted that we went. Of course the setting of Monument Valley is beautiful, and could even be considered historic for movie buffs, but of greater interest to me was the history of the locale. With a Native American guide whose family has lived in the area for generations, I felt we gained a true insight into the lives of the Navajo and Anasazi people who have lived in the area in centuries past. The petroglyphs, the numerous food storage sites, the “ladders” of hand and toe holds carved into the face of the rocks that were used to climb nearly shear bluffs, etc. were all unique and simply amazing. Additionally, it can’t be denied that riding with folks dressed in period garb of the Old West helped make the event more visually interesting. Looking up and suddenly seeing someone in a cavalry uniform, or buckskins, or a “fish oil” rain slicker, against the backdrop of the scenery of Monument Valley couldn’t help but make one feel like they were in a John Ford movie, at least momentarily. This in addition to wonderful wranglers, horses, accommodations and food made the event memorable and very enjoyable. As a kid I spent Saturdays either in the movie theater or in front of the TV watching those wonderful old westerns (I still do!). Well, I just got to live the dream again, that one that I hoped, and hoped again, to ride where those cowboys and soldiers did, right through iconic Monument Valley! This is the land of The Searchers, Fort Apache, How The West Was Won, and I got to be John Wayne’s Capt. Nathan Cutting Brittles (She Wore a Yellow Ribbon) as he led his troopers to deal with the Indians. This was my fourth trip with Steve and Marcie, and as always, it exceeded expectations. The stock was first class, the wranglers most willing to work with my riding abilities, and I had the freedom to fulfill another dream. The food and accommodations were excellent which made it all the better. I’m already writing my check for The Great Train Robbery in September 2014. It is obvious from the outset that Steve and Marcie love doing this, and that makes it even more enjoyable. And I especially appreciate how easy you both made this ride for Shari, my wife (non-riding spouse) to pick and choose how she participated. Thank you, thank you, thank you. The Monument Valley Ride was a phenomenal experience … my son, Matt, and I enjoyed it tremendously. I think you and Marcie are two of the finest and funnest people I know. I really enjoyed the time with you two. Thanks so much again for the great time. You guys do a tremendous job! I don’t know if all the participants really understand or fully appreciate the time, frustration, and work you go through to make these rides happen. I wish I were a really good writer because I could probably write a dissertation … these adventures certainly deserve it. What you do is truly unique – thanks friends. So here is my ‘real’ testimonial: How do you describe one of the truly unique events or experiences in your life? Amazing, awesome, terrific, unbelievable, unforgettable, special … All those words and more really do not do justice to Steve and Marcie Shaw’s John Wayne’s Monument Valley Ride. I truly love the Old West and it is one of my passions in life. I am also a passionate John Wayne fan – the reel and real “Duke.” Half of my house has John Wayne memorabilia, pictures, original artwork, books, full-size stand-ups, hats, posters , clothing: the list goes on. My grandchildren even call me Duke! When I saw that Great American Adventures was offering this ride, I had to sign up. This is my second ride with Steve & Marcie as Matt and I participated in Steve’s 2011 Wyatt Earp’s Vendetta Ride in Tombstone. It too was an awesome, fun adventure and experience – beyond words – and introduced me to two of the finest people I know – Steve and Marcie Shaw (Ellsworth T. Kincaid and Lady Stetson). In fact, Matt and I are going on 2013’s Vendetta Ride! The Monument Valley ride was incredible. Matt and I actually got to ride in and see some of the locations where John Ford and John Wayne made some of their best Westerns; Stagecoach, The Searchers, Fort Apache, She Wore a Yellow Ribbon and Rio Grande. WOW! I was actually there. We even stayed at Gouldings Lodge where Wayne, Ford and many of the cast members stayed when making those movies. The Vendetta Ride is an amazingly historical adventure and Matt and I truly love the history and the mystic of Tombstone. I am a stickler on the historical, period correctness of the Old West. But the John Wayne ride was especially exciting for me. I got to see where one of my favorite people did some of his best work and I got to spend another quality, special week with my son. I also got to spend a special week with some old friends and meet some new ones. What Steve and Marcie do at Great American Adventures is not only unique and exciting, but powerful. The work that they put into these adventures is hard for most of us to imagine. It takes months and hours and hours of conversations, phone calls, meetings, organization and patience. I can only imagine the time, energy and frustration Steve and Marcie expend making one of these adventures a reality. But, it pays off because every detail is addressed and they provide the best possible experience from the daily rides and activities, the first-class wranglers and horses, the meals and some special, unique surprises; everything is “FIRST CLASS.” Steve plans an exciting week for all participants. How does he pull this off so well time and time again? Passion – he and Marcie are obviously passionate about these adventures and it shows in every aspect. Thank you again, Steve and Marcie. I got to know you both a little better and I truly call you friends. I am still amazed that you can offer such adventures at very reasonable prices. You definitely are “first class” in every sense of the word and Great American Adventures has provided a means to visit my passion, renew friendships and make new ones, participate in truly unique adventures and enjoy life-memorable times with my son – which is priceless. This was an absolutely beautiful ride. Every day brought something new including days that were filled with John Wayne / John Ford film sites. Other days were filled with the life of the Navajo people and their ancestry, and other days were filled with beautiful scenery. A special touch was our Navajo guide, whose family had participated in many film shoots over the years. I was also very pleased the wranglers were able to switch me out of the horse I was on the first day. I suffer from Lymph edema in one arm as a result of cancer surgery and it would have been very hard on my arm to fight with my horse all week. I ended up on a great horse for my stage of life and felt comfortable the rest of the week. The “John Wayne Monument Valley Ride” was the one of those lifetime rides for a lifelong Western buff such as myself. This ride was more than a John Wayne ride; it was a John Ford ride, too. Our fearless leader tagged our band of 20 riders “The Searchers” as we rode in ‘search of movie sites’ within the valley. I was particularly taken by the many ‘sites’ we saw from John Ford’s 1964 production of “Cheyenne Autumn.” As we approached the Valley’s “Totem Pole” I could envision the stars from that film standing before us. How cool was it that our Navajo Guide was an extra in this film as one of the Cheyenne children. The “Totem Pole,” the village school foundation, the “Victory Cave,” and the “Three Sisters” monument – it was all there! For a film buff to see this while on horseback was a dream come true. Of course, getting our photo near “John Ford’s Point,” seeing Scar’s – from the film “The Searchers” – campsite location, where Natalie Wood was rescued by John Wayne at the end of the film, plus the Duke’s cabin, or his character Captain Nathan Brittles cabin from “She Wore a Yellow Ribbon” film — all too awesome to describe. Of course, riding through the scenery of the Valley, the numerous Anasazi cliff dwellings, ancient pictographs on bluff faces, going “heeled” as Duke’s characters had done in his movies … heck, even the food was terrific every day. Anyone who enjoys Westerns, especially those made by John Ford and starring John Wayne, such as The Searchers, She Wore a Yellow Ribbon, and Fort Apache is familiar with the huge geological formations that make up Monument Valley. While anyone can enjoy them from the comfort of their car, or on a bus tour, the absolutely best way to experience them is on horseback. Steve Shaw’s Great American Adventures provides that opportunity. Over a period of four days we rode into the interior of the Monument Valley Tribal Park, visiting several film locations impossible to see from the road, and enjoyed magnificent vistas only the local Navaho ever see. Along the way, we saw many ancient Anasazi ruins and drawings, and geological wonders. On average we rode about 3 hours, took a break for lunch, and then rode for about another three hours, before heading back to Gouldings Lodge for dinner and a relaxing night in our comfortable rooms. Along the way to the lodge, we enjoyed seeing the gorgeous light transformations on the rocks as the sun set, and after dinner seeing the billions of stars overhead. All the meals are provided and the food was very good, even the sandwiches provided for our trail lunches. I have a food allergy and the restaurant staff kept me well informed on what I couldn’t eat, and twice provided me a separate option for meals. On two evenings we had a cookout: the first night at the foot of the Three Sisters near John Ford’s Point that was used in the film The Searchers, and the other night in the vicinity where Colonel Owen Thursday (Henry Fonda) met his heroic end in Fort Apache. Dressing up in Old West style clothing is encouraged though not required, but doing so definitely adds to the adventure, especially when one is dressed like one of John Wayne’s characters! Great American Adventures provides links to recommended vendors to help you create the look you want. Or you can come as you please, though a hat, boots, long pants, and a long-sleeved shirt are recommended, as the sun, even in November, can be intense. 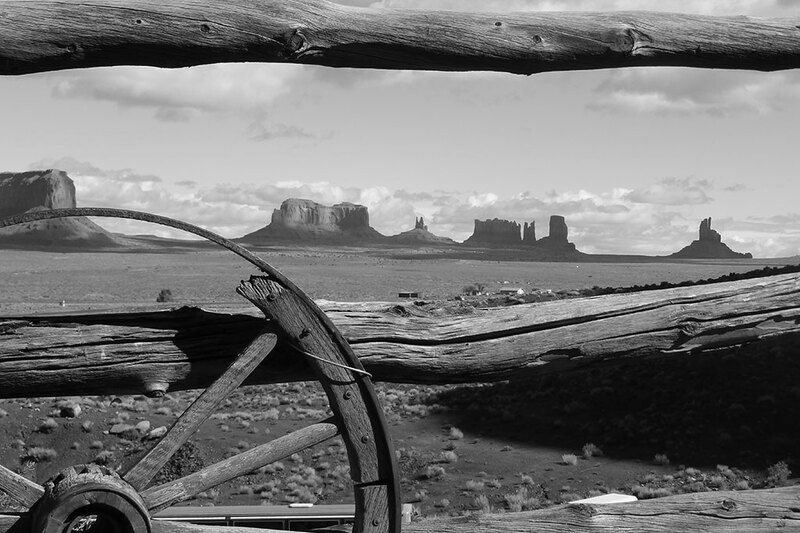 If you want to see the iconic West as envisioned by John Ford and enacted by John Wayne, doing so on Great American Adventures’ John Wayne’s Monument Valley Ride is absolutely the best way to do it. I’ll be going again. John Wayne’s Monument Valley Ride was a most fantastic ride of a lifetime. We will never forget seeing the beautiful red sandstone pushing skyward from the desert floor. The magnificent views of Three Sisters, the Mittens, and Totem Pole from horseback was an awesome experience. From our great Navajo guide we learned about the rock formations, petroglyphs and pictographs, and the history of the Navajo people. The visits to the different film locations of The Searchers, She Wore a Yellow Ribbon, and Cheyenne Autumn was a highlight. All the meals, at Gouldings Lodge and during our cookouts, were 5 star! We also enjoyed the friendships and camaraderie of the group and especially of the wranglers, who took such great care to ensure we were safe and happy with our horses. This was one ride we did not want to end. So we will see you in the future on other rides. Thank you Steve & Marcie, and all the other riders, for an experience of a lifetime. Having been on several rides with you and Marcie, I believe we can speak with some knowledge and understanding on what it takes to put on a successful, exciting and fun filled horseback adventure. This ride was one of the best we have been on to date. Your attention to detail, your continued endeavoring to give the best value for your customers vacation dollar and your personal hands-on attention to all of your guests needs; combined with the spectacular beauty of Monument Valley, made this trip a real winner. I happened to see the John Wayne’s Monument Valley Ride in American Cowboy magazine and never dreamt it would lead to such a wonderful adventure. The scenery was spectacular, the Navajo guide was very knowledgeable and the wranglers couldn’t do enough for you. The horses were well suited for this ride and all-in-all it was a great ride for all ages. We met wonderful people we will never forget. Well done, Steve & Marcie.